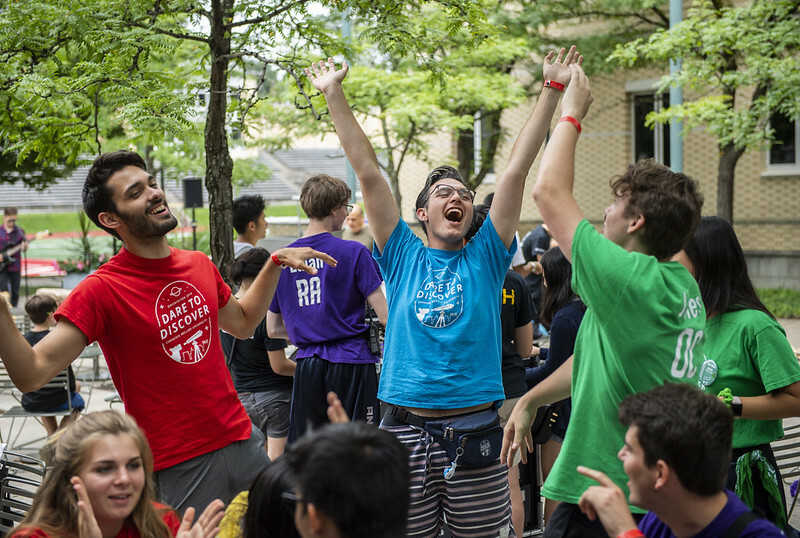 With the start of the fall semester, Carnegie Mellon University is welcoming thousands of newcomers to its Pittsburgh campus community. More than 500 students gathered at Carnegie Mellon's Legacy Plaza on Saturday, Aug. 25, to meet on-campus community groups and neighborhood business partners from CMU's annual Craig Street Crawl. Many of the freshmen who attended were excited at the opportunity to explore student activities and local businesses. Tessa Vermeulen, a first-year student majoring in flute performance, said the event allowed her to branch out and meet new people. "I discovered that the variety of interests and people here is not just beneficial for my musical experience but for my experience as a person overall," Vermeulen said. Jeff Kim said the event gave him the opportunity to sample ballroom dance at a demonstration given by CMU's Ballroom Dance Club. "I'm definitely excited to try new things — I had never danced before!" said Kim, who is majoring in computer science. The event demonstrated long-standing collaborations between student groups and Pittsburgh collectives. The student group Sustainable Earth handed out plants to new students while the Center for Creative Reuse, a local Pittsburgh nonprofit that focuses on sustainability and recycling practices, showed students how to decorate their plant holders with recycled wires, ribbons and knit materials. "We sell comics and games and Carnegie Mellon has a strong percentage of people interested in that sort of thing, so we've had a nice relationship," said store owner Jeff Yandora. Orientation Provides Ways for Students To "Dare To Discover"
Approximately 1,565 first-year students joined the CMU community last week as they moved into campus housing and took part in Orientation activities under the theme "Dare to Discover." At Thursday's Convocation, CMU President Farnam Jahanian welcomed the Class of 2022+ to the official start of their college experience. "The next four years will undoubtedly be some of the most transformative of your young lives. You will begin lifelong friendships and discover passions that ignite academic and professional careers," Jahanian said. "CMU will change you, and you will change CMU. We are so excited for the journey you are about to embark on." Jahanian thanked the many faculty, staff and students who made new students' first few days on campus welcoming. Over the past week, 156 Orientation leaders and counselors, 220 student volunteers and countless staff have worked at more than 200 Orientation events. More than 120 resident assistants, community advisers and housefellows also have helped students settle into their new homes on campus. Interim Provost Laurie Weingart said the palpable energy of a new academic year helps make Orientation week one of her favorite times. Weingart reminded the class that, while they likely were drawn to CMU for its academic excellence in the arts, science, technology or business, CMU is more than a collection of classes, academic majors and departments. The university community is dedicated to students' growth and nurtures learning, discovery, and creative pursuits within and outside the classroom. "This convocation is special because it welcomes each and every one of you into our community, for your entire time on campus, and forever once you graduate," Weingart said. As first-year students embark on their college experience, other speakers reflected on their own academic journeys. Conrad Zapanta, a CMU alumnus and parent of two first-year students, told students to step outside of their comfort zones and to ask for help when needed. "Asking for help is not a sign of weakness. It's a sign of strength. Asking for help demonstrates that you know that you can't do this alone," said Zapanta, associate head for undergraduate education and a teaching professor in biomedical engineering at CMU. "As a faculty member, the thing that makes me the most upset is when students struggle, and sometimes fail, in my classes but they never came to me for help. I could have helped them, but they never asked me for help." Student Body President Roshni Mehta told students not to let a fear of failure stand in the way of trying something new. "It's all about gaining experience that you won't regret," Mehta said. "You'll be a more well-rounded person because of it." Mehta also spoke from experience as she told students to give themselves time to find their true interests. A third-year student with a double major in economics and ethics, history, and public policy at CMU's Tepper School of Business and Dietrich College of Humanities and Social Sciences, Mehta originally planned to study biology. While at CMU, she discovered she had a passion for public policy, and she combined it with economics, which provided a foundation for public policy work. "Even though I don't know quite what I want to do after college, I know that CMU has given me the skills and support to figure it out," Mehta said. "You too will go through these changes and figure out your path." On Sunday morning, President Jahanian welcomed students and their families to campus Sunday morning. "Congratulations on all of your achievements that have led you to this moment. You are among the brightest, most motivated, exceptionally gifted and wonderfully independent members of your generation," Jahanian said. The Class of 2022+ consists of students from 45 states and 30 nations around the world. "You are joining an exceptionally multi-cultural and multi-national community here at CMU — we are a true microcosm of our interconnected world. Our 1,400 faculty come from 48 nations and 110,000 alumni live and work in 130 countries around the globe." President Jahanian told students their work will impact the world, and encouraged them to branch outside of their academic boundaries and take advantage of CMU's extraordinary intellectual and creative community. "This generation — your generation — will write the story of this century. You will advance human knowledge, drive our economy with your ideas and shape our culture with your creativity," Jahanian said. 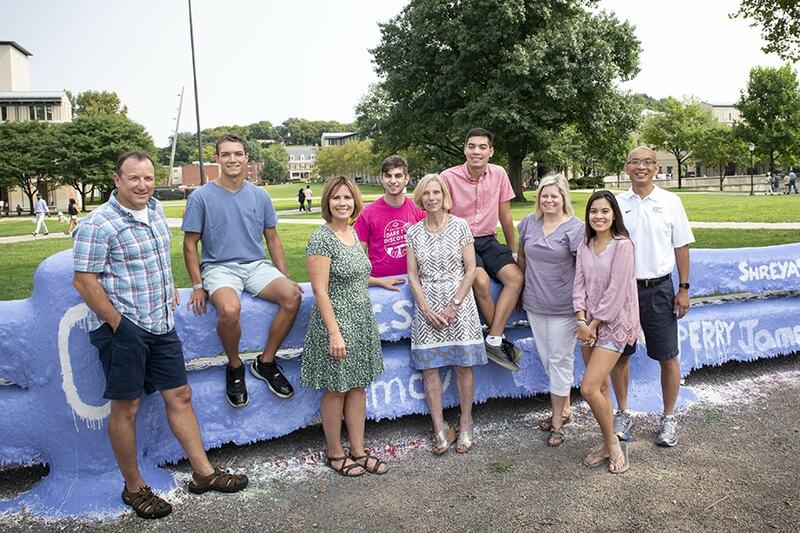 Gina Casalegno, vice president for Student Affairs and dean of Students, welcomed students and their parents to campus. "You are here because we see in you the talent, the intellect, the passion necessary to thrive in your chosen field," Casalegno said. Casalegno also led a panel of students Daniel See and Sophie Halpern, and the assistant dean of Educational Initiatives in the Dietrich College of Humanities and Social Sciences Jennifer Keating to discuss their CMU experience. "One of the riches resource we have on campus is the people. They are some of the most driven people I've ever met. They are really willing to follow the questions," Keating said. Head Orientation Counselor, Lily Marty, a senior in social and decision sciences and psychology, shared her excitement for the upcoming school year with the new students and their families. "Let me be among the first to welcome you to your new school, your new campus, and what will hopefully become your new home," Marty said. Alumni Association Board President Alex DiClaudio a 2009 Dietrich College and a 2011 Heinz College of Information Systems and Public Policy alumnus, added his own welcome and encouragement. "On behalf of the over 110,000 in over 45 countries, let me be the first to welcome you into the Tartan community.' All of us all around the world will be supporting you and rooting for you as you embark among this amazing journey," DiClaudio said. "Our hearts are in the work, and it's that work that will bond you with the rest of the CMU family." The Class of 2022 received a record-breaking 24,353 applications — a 19 percent jump over last year's application numbers. Suzie Laurich-McIntyre, assistant vice provost for graduate education, greeted more than 2,700 incoming graduate students from 64 countries to the university on Tuesday, Aug. 14. 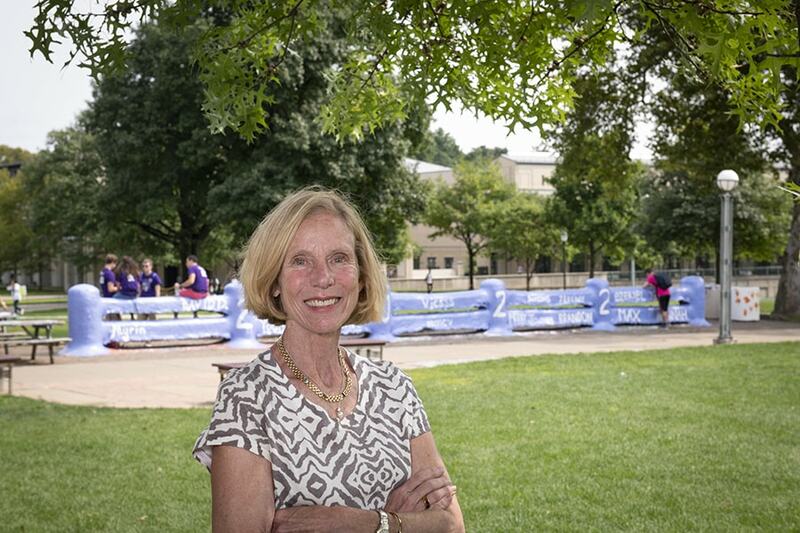 "We hope you will take the initiatives to explore Carnegie Mellon to be an active member of the intellectual and social community here on campus and in the Pittsburgh region and to grow and expand your horizons," Laurich-McIntyre said. President Jahanian told the incoming students that they have the talent, ideas and abilities to make their marks, and that they have arrived at an exciting time. "CMU is at the center of a societal transformation. And, of course, this societal transformation is catalyzed by the digitization of information, automation, the democratization of knowledge and unprecedented access to data and analytics," Jahanian said. "But thanks to our excellence in computation and data, and our reputation for interdisciplinary problem-solving and relentless creativity, Carnegie Mellon is exceptionally well-positioned to write the story of this century." New students are joining an intellectually diverse community, Jahanian said, which has produced 20 Nobel laureates, 12 Turing Award winners, and 79 members of the National Academies of Engineering, Science and Medicine. At the same time, CMU alumni have won 47 Tony Awards, 10 Oscars and 124 Emmys, and students have been honored for their academic achievements with Churchill, Fulbright and Goldwater scholarships, among others. Amy Burkert, vice provost for education, told the students that Carnegie Mellon aspires to educate not just "agents of change but architects of change." "First, dare to take risks and dream big," Burkert said. "Second, believe in yourself and your ideas, even when others might not. Third, think beyond what is, to what could be. Fourth, never stop exploring the unknown and probing new frontiers. Reach for and beyond the stars. And finally, don't give up, even if your first attempts are unsuccessful because your work may indeed change our understanding of the world." Casalegno told the students that the university is not only concerned about their academic development but also about supporting their well-being. "We are dedicated to the development of an engaged community ... where you are supported in all facets of your experience while you do work that matters," Casalegno said. Graduate Student Assembly President Surya Aggarwal, a fifth-year Ph.D. candidate in biological sciences, said when he started at CMU he recalled being nervous wondering if he had made the right choice. "If there is one thing I can tell you, it is that you do belong here," Aggarwal said. "Carnegie Mellon is an exceptional place, and you have been handpicked by your respective programs to attend this prestigious institution because they believe in your abilities — we believe in your potential to change the world." 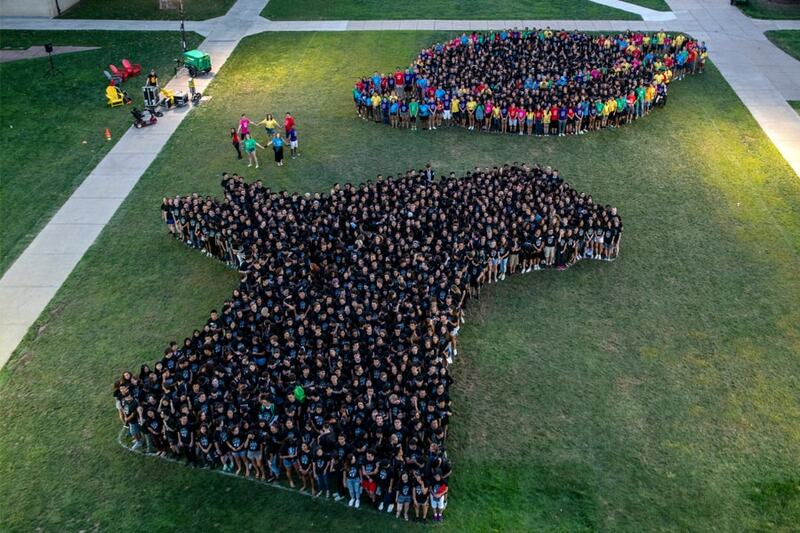 First-year students created a class photo depicting this year's Orientation theme, "Dare to Discover." They formed a Scotty Dog — the school mascot — looking up at the planet Saturn. Watch a timelapse of how the image was made on YouTube, and get a behind-the-scenes look at Orientation by following Carnegie Mellon University on Facebook, Twitter, Instagram and Snapchat.